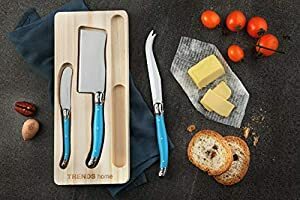 Amazon Giveaway: TRENDS home Cheese Knives Set, Premium 3 Pc, Highly Polished Stainless Steel Triple Rivet Bolster. Cheese Knife Set, Cheese Knife, Cheese Cleaver & Spreading Knife. Color - Hampton Blue Cheese Knives. TRENDS home Cheese Knives Set, Premium 3 Pc, Highly Polished Stainless Steel Triple Rivet Bolster. Cheese Knife Set, Cheese Knife, Cheese Cleaver & Spreading Knife. Color - Hampton Blue Cheese Knives.